G&S Discography: Where Shall I Find Another? Where Shall I Find Another? Collectors have long known that HMV sometimes published alternative takes; hence, supposedly "identical" sets might not contain the same performance on all sides. In most cases, this was done probably because the masters for the "preferred take" either wore out or became damaged. But in at least one case ("Take a pair of sparkling eyes," on the 1919 Gondoliers), HMV apparently decided simply to re-record a side with a more popular singer. During the research for their CD re-issues of this series of the recordings, Chris Webster and Jim Lockwood accumulated and compared sets with numerous collectors. The two also collaborated on many of the transfers that they both used. Each published CD, of course, contained just one version of each side. 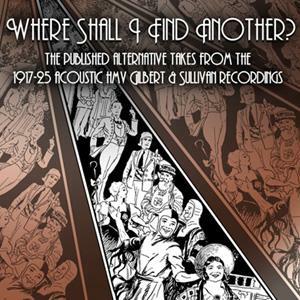 The present CD, appropriately titled "Where Shall I Find Another," contains every known published alternative take from the series. Anyone who purchased the complete series of nine recordings from either Webster and/or Lockwood will receive this disc for free. The CD is also available at cost from those who have not bought all nine of the acoustic recordings from these two publishers. It might be regretted that the alternative takes were not published with their respective operas, as this would make comparisons a lot easier. I confess that this would have been my mild preference, although Chris offers a couple of practical reasons why this was not done. First, several of the acoustic recordings just barely fit on one CD; adding the alternative takes would have required these sets to be issued on two CDs, which might have deterred many buyers, and certainly would have been a waste of a CD for just a few minutes of extra material. Secondly, should further alternative takes be discovered, just one disc would need to be re-issued. The alternative takes, in the order presented on the CD, are listed below. Note that the individual pages for each recording include a "recording sessions" table, which lists all of the takes — whether published or not. Despite Chris's "best endeavours," it is conceivable that other takes were published that have not yet been discovered. 01 Overture Light Opera Orchestra. 02 I hear the soft note (Act I finale — pt. 4) Ensemble. 03 But who is this? (Act I finale — pt. 4) Walker, Frederic Ranalow, Essex, Baker, etc. 04 Sad is that woman's lot ... Silvered is the raven hair Nellie Walker. 05 Love is a plaintive song Violet Essex. 06 So go to him and say to him Edna Thornton and George Baker. 07 I hear the soft note (Act I finale — pt. 4) Ensemble. 08 A wand'ring minstrel John Harrison. 09 With aspect stern (Act I finale — pt. 1) Essex, Harrison, Radford, Baker, etc. 10 See how the fates Thornton, Bessie Jones, Radford, Baker and Harrison. 11 The flowers that bloom John Harrison and George Baker, etc. 12 I once was a very abandoned person Leo Sheffield and Eileen Sharp. 13 My eyes are fully open George Baker, Eileen Sharp and Leo Sheffield. 14 How say you, maiden? Robert Radford, Violet Essex and George Baker. 15 I've jibe and joke George Baker. 16 'Tis done! I am a bride! Violet Essex. 17 Night has spread her pall once more Edna Thornton, etc. 18 List and learn (Act I opening chorus — pt. 1) Ensemble. 19 We're called gondolieri (Act I opening chorus — pt. 3) Harrison and Baker. 20 And now to choose our brides (Act I opening chorus — pt. 3) Harrison, Baker, etc. 21 Bridegroom and bride Chorus. 22 When a merry maiden marries Edna Thornton, etc. 23 Now pray what is the cause? (Act I finale — pt. 3) Derek Oldham, George Baker, etc. 24 Take a pair of sparkling eyes Tudor Davies. 25 With ducal pomp George Baker, Edna Thornton, etc. 26 On the day when I was wedded Edna Thornton. 27 I am a courtier George Baker, etc. 28 Orchestral Selection Light Opera / Mayfair Orchestra. 2001 Sounds on CD CD VGS 225 These two issues have identical content. See explanation above.